Waga Energy and Veolia cut the ribbon on a WAGABOX® unit at the waste-management leader’s Saint-Palais, France landfill on December 7, 2018. The unit — the fourth WAGABOX® in France and the first at a Veolia waste-treatment facility — was commissioned on November 6, 2018. It now supplies 3,000 households in Saint-Palais and surrounding communities with biomethane, while eliminating 4,000 tons of potential CO2 emissions per year. 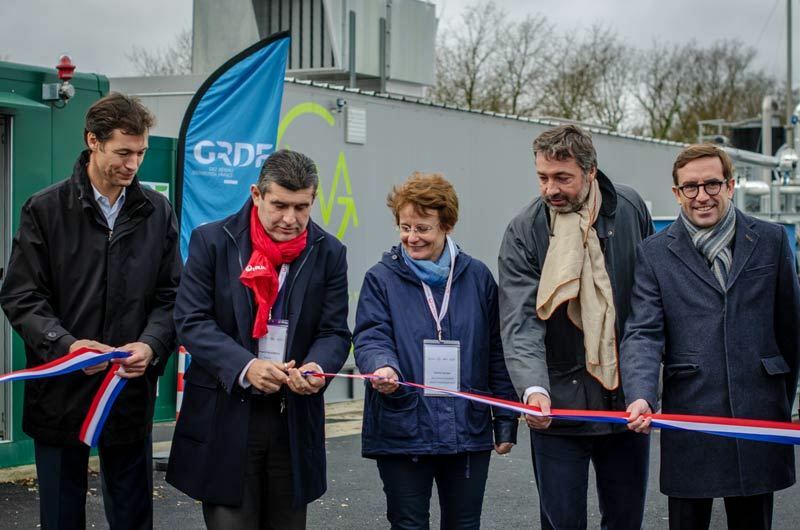 The ribbon was cut by Bernard Harambillet, VP Waste Recycling & Transformation, Veolia France, at a ceremony attended by French energy agency ADEME’s Chairman Arnaud Leroy. Some 150 visitors took advantage of the event to tour the facility. Left to right: Mathieu Lefebvre, CEO Waga Energy, Bernard Harambillet, VP Waste Recycling & Transformation, Veolia France, Karine Vernier, Manager of the Energy and Circular Economy program, SGPI, Arnaud Leroy, ADEME’s Chairman, and Aymar de Germay, President SDE38.